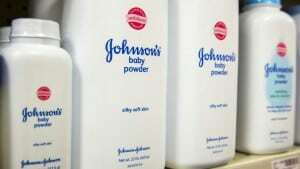 Johnson & Johnson has been ordered to pay $72m (£51m) to the family of a woman whose death from ovarian cancer was linked to the company’s talc-based baby powder. A jury in Missouri awarded $10m of actual damages and $62m of punitive damages to the family of Jacqueline Fox, her family’s lawyers said. In a statement, Johnson & Johnson said: “We have no higher responsibility than the health and safety of consumers and we are disappointed with the outcome of the trial. The lawsuit alleged the health products firm actively covered up studies that suggested a link between ovarian cancer and their baby powder in order to boost sales. Several hundred similar lawsuits have been filed against Johnson & Johnson, but Monday’s verdict was the first in the US to award damages over the claims. In 2013, a federal jury in South Dakota found that a woman’s use of Johnson & Johnson’s body powder products was a factor in her developing ovarian cancer, but jurors did not award damages in the case. The company in 2011 vowed to remove “chemicals of concern” from its baby products, the AP news agency reported. It said its adult products would be reformulated by 2016. Ms Fox, of Alabama, claimed she used Johnson’s Baby Powder and Shower to Shower for more than 35 years before she was diagnosed with ovarian cancer three years ago. She died in October at age 62. Jurors in St Louis deliberated for four hours on Monday following a three-week trial. They found Johnson & Johnson liable for fraud, negligence and conspiracy. Ms Fox’s son, Marvin Salter, who took over his mother’s lawsuit after her death, told the St Louis Post-Dispatch he was “speechless” when he heard the amount of damages awarded by the jury. “To think how groundbreaking this could be for so many other women,” he told the newspaper. Valeant Pharmaceuticals International Inc, which now owns the Shower to Shower brand, was not named as a defendant in the case. HalalFocus comment: Are the ingredients that are known to be linked to cancer in personal care products forbidden in the Halal certification of them? It is time for the Halal industry to expose these ingredients in food and personal care, and not accept them in their products for not being Tayyib.